Within the National Archives at Kew, London, Josef Jakobs' KV 2/24 file contains copies of his medical records from Dulwich Community Hospital. The medical records have the original x-ray images of Josef's fractured leg. These images naturally do not photocopy well but the National Archives has helpfully digitized some of these x-rays. The National Archives has five images of Josef's x-rays available for purchase, conveniently labeled 1 to 5. The images are not in chronological order. Images 5 (Feb 3) and 2 & 4 (Feb 5) are the most interesting. Image 3 was taken on Feb 3 and shows the upper part of the tibia and fibula. Image 1 was taken on March 4 and shows the partially healed fractures. According to the medical records, Josef had a "comminuted fracture of the lower end of shaft of tibia and fibula with overlapping tibial fragments and forward displacement of the tibial fragments". This rather dense medical description becomes more understandable when accompanied by the x-rays. As they say, "a picture is worth a thousand words". The word "comminuted" simply means that the bone was broken into multiple fragments or splinters. 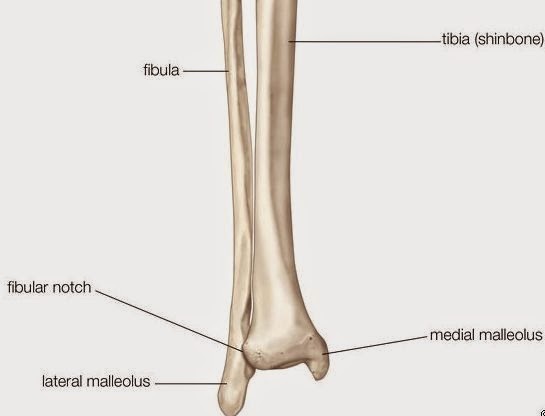 The fibula is the smaller bone in the lower leg, whereas the tibia is the larger bone in the lower leg (also known as the shinbone). Image 5 was taken on February 3 and shows a side view of Josef's lower leg. One can clearly see the forward displacement of the large lower leg bone, the tibia. The fractured fibula (the small lower leg bone) can be seen behind the tibia. Image 2 was taken on February 5 and shows a frontal view of Josef's lower right leg. One can clearly see the comminuted fracture of the smaller leg bone, the fibula. The fracture of the fibula is faintly visible. Image 4 was taken on February 5 and shows another side view of Josef's lower right leg. One can see the post-surgical realigment of the tibia. The fractured fibula can be seen behind the tibia.